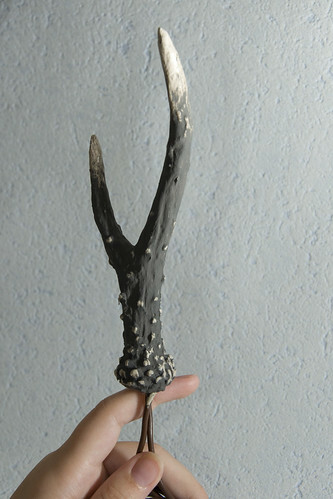 Last Summer I made a Jackalope and got some requests for an antler-tutorial. It's been lying around on my desktop almost finished for half an year because I had to move twice since then and everything was a bit annoying. But now as everything is back to normal again, I finished the tutorial. 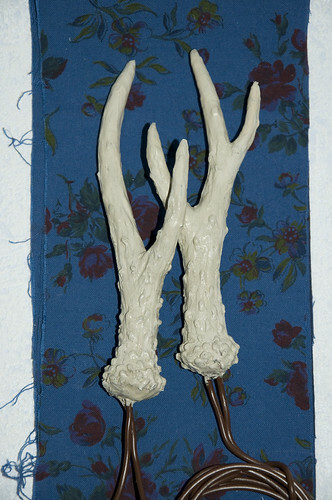 I would suggest to look at pictures of real antlers before starting. 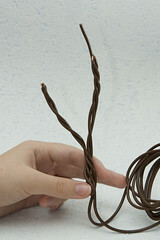 the size of your finished antler is defined by the length between the tip/end of your wire and the first bend. 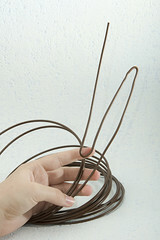 Dont't cut the wire yet, wait until you formed the whole "z"-shape like I did in the picture. 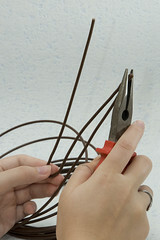 Use your pliers to press the bends on the pointy end of your antler as flat as possible. 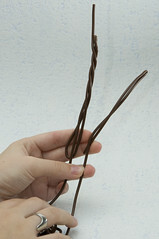 Every point consists of a piece of wire that's bent two or three times. You can choose to make your antlers bigger by adding more points. 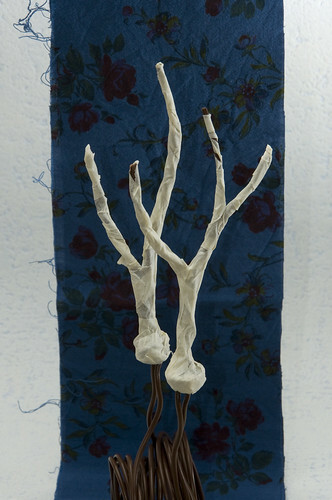 Depending on what you're planning to do with the finished product, leave at least half an metre of wire on for attaching your antlers. 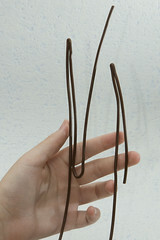 I'm planning to make an headband out of them and i will be using the wire as the headband, so i left about an metre of wire on just to be sure it's enough. The two different pieces will make the different points. Cut both pieces about the same lenght, it's way easier to handle them that way. 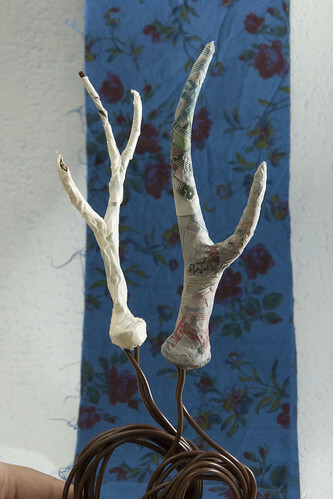 Twist the individual points and wrap them together at the bottom of the antler. 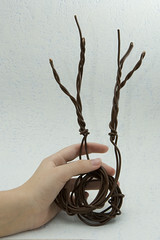 Wrap a single strand of wire around the very bottom of the antler to get the characteristic shape. Then just secure the loose ends somehow, I made loops so I could hang them to dry. Also, this will be the "handle" while you are painting everything in the end. 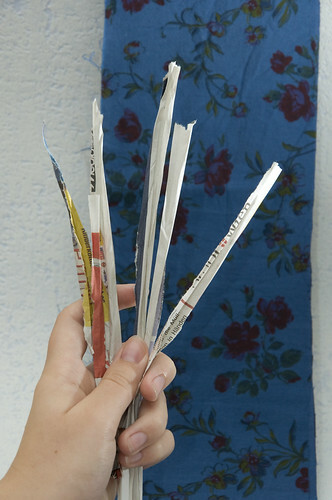 Prepare lots of narrow strips of newspaper before you get your hands sticky. 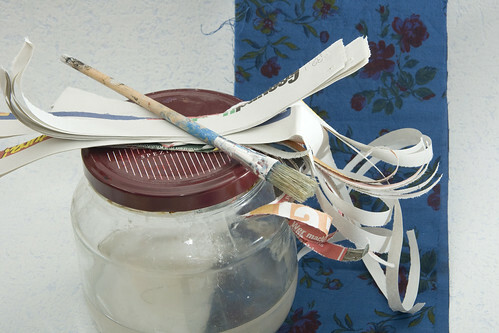 You will also need the wallpaper paste and a paint brush at this point. I think that part is pretty self-explanatory. 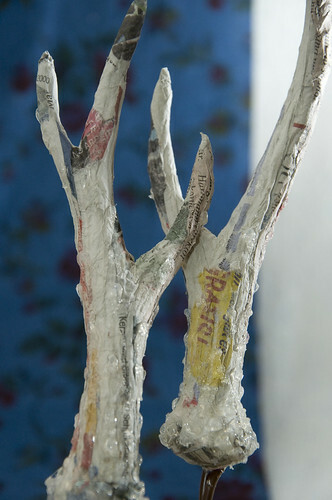 Add paper mache until both pieces have a nice even shape. It doesn't have to be perfect as the surface will be worked on in the next step. 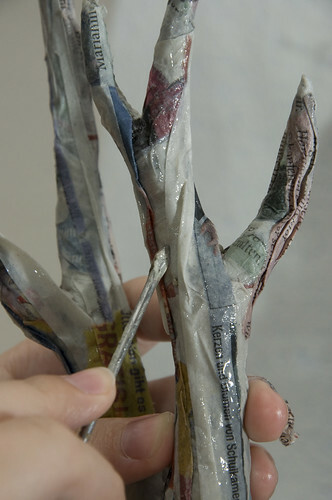 Take fine strips of newspaper and twist and fold them a little. 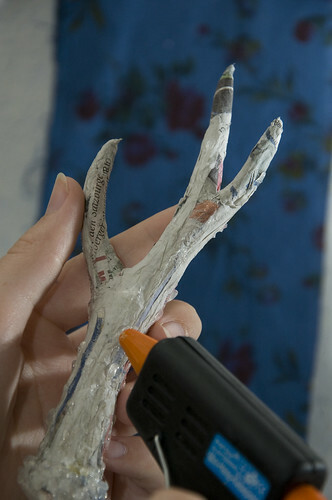 Then attach them to the antlers with your wallpaper paste, using a screwdriver or something similar to get the shape right. This will give your antlers the typical, slightly furrowed surface. Now you can hang them to dry for a few hours. Deer antlers usually have this little dots/balls/whatever they are called at the bottom of the antler, gradually starting getting smaller and fewer towards the top. I get the effect using my hot glue gun to ad lots of tiny dots of glue. It can be a bit of a problem to get the paint on there in the next step. It really helps the paint to adhere if the glue gets a light coat of hairspray before you start to paint. Time for painting, you are almost finished! First paint the whole thing in a bone-ish color and let it dry. I mixed ochre, white and a tiny bit of red to geht a result I was satisfied with. After the "bone" has dried, add the dark brown layer. I mixed ochre, black, a bit of white, a bit of green and a bit of red to get the right color. 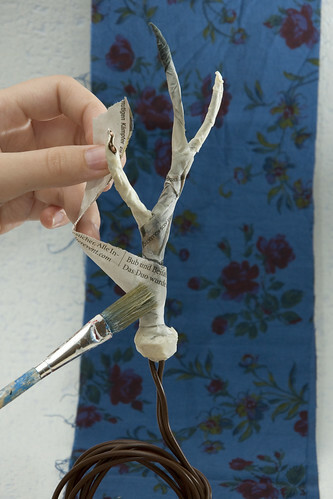 Wipe the dark paint off from the parts where the bone shows through as long as the paint is still wet. Just imagine how the deer basically does the same by rubbing his antlers against trees and fighting with other deers It doesn't have to be very exact, just don't take away too much of the brown. After the paint has dried completely, add at least one or two coats of varnish or sealer to seal your antlers and make them waterproof. 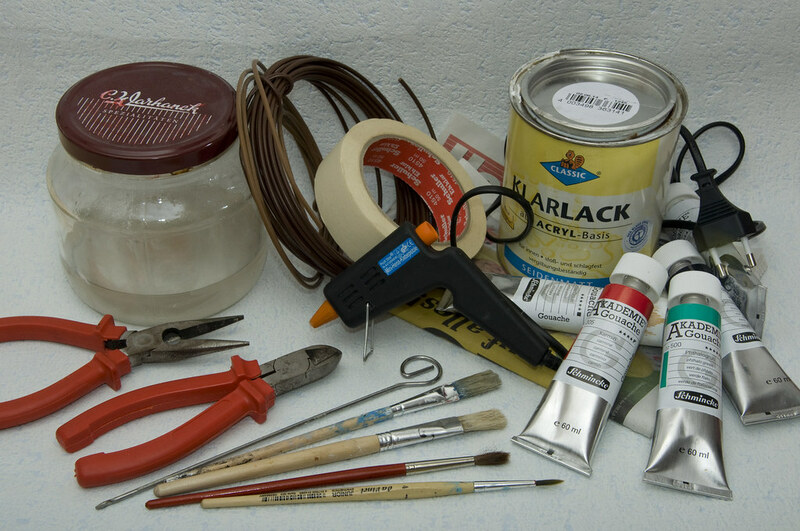 If you used water soluable paint before, apply the first coat carefully. 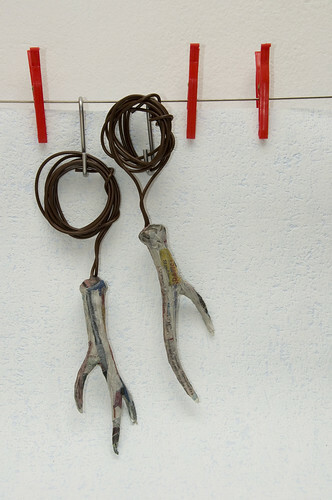 Now you can attach your new antlers to whatever you think deserves some. You can find the tutorial is on my blog as well. 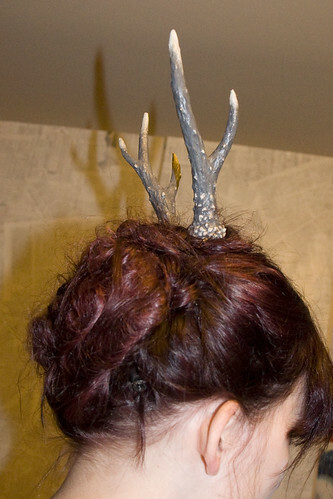 Gorgeous antlers, want some for the wall, for in my hair, as a hat hanger. Wow, thank you so much for sharing! These are spectacular! oh, wow! this totally ROCKS! thanks for the tutorial. Love 'em! Those are amazing! Great tutorial too, thank you! Brilliant tutorial, thank you! I'm pretty sure I need some antlers now. Wow, that's a lot of response. I'm glad you like it. Beautiful! I love that you added the bumps (i think they are called burrs)...they really make the horns look realistic. AMAZING!! Thank you so much for taking the time to provide us with this awesome tutorial. They way you used the hot glue is genius! Antler Monogram for the Gate! Mavis Gets Valentine's Day "Antlers"!